Property sold in as is condition. Loan Approval Letter or Verification of Funds if cash offer, Agent Checklist, Seller Disclosure, Lead Base paint, and Termite Report with all offers. Do not send any offers without all of the above. 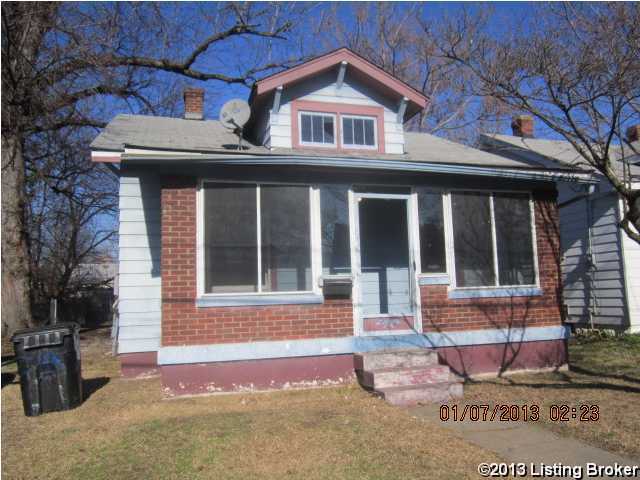 This property is eligible under the Freddie Mac First Look Initiative through 1/31/2012. Offers only from Owner Occupants, Neighborhood Stabilization Program Grantees and non-profits engaged in community stabilization efforts will be considered the 1st 15 days of the listing. Investor offers will be considered on the 16th day of the listing which will be 2/1/2012. Direction: Taylor to Sale Ave.
1209 Sale Ave, Louisville KY 40215 is a Home, with 2 bedrooms which is recently sold, it has 912 sqft, < 1/4 ACRE sized lot, and Street parking. A comparable Home, has 2 bedrooms and 1.5 baths, it was built in and is located at 1406 Woody Ave Louisville KY 40215 and for sale by its owner at $ 62,498. This home is located in the city of Louisville , in zip code 40215, this Jefferson County Home, it is in the NONE Subdivision, and HIGHBAUGHS POWELL are nearby neighborhoods.